Yesterday’s signals were not triggered as there was no bullish price action at 1.3250 or 1.3208. Go long after the next bullish price action rejection following the next touch of 1.3165. Go short after the next bearish price action rejection following the next touch of 1.3249 or 1.3295. I wrote yesterday that I didn’t see any resistance as reliable until 1.3332. There was no good trend to exploit and most of the key levels did not look particularly strong, so this pair was probably best avoided for the time being. This was an OK call as I didn’t see a way to predict what eventually happened. 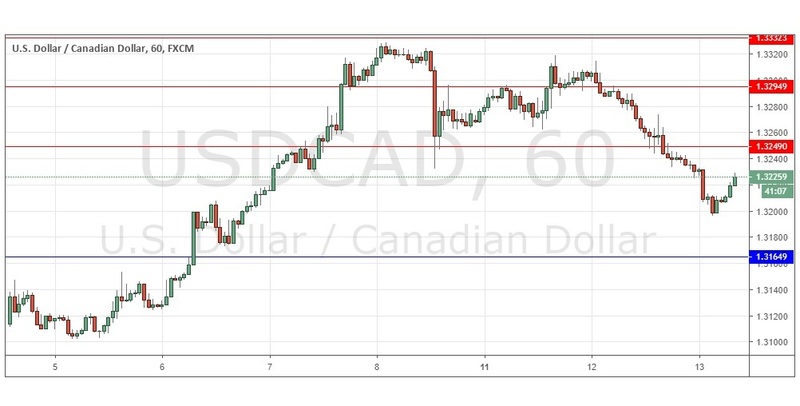 The price is still in a medium to long-term range, and the levels still look unreliable, so no change to my approach here for the time being – better opportunities likely elsewhere. There is nothing of high importance due today regarding the CAD. Concerning the USD, there will be a release of CPI data at 1:30pm London time.